Shop Hosa SKT Pro 14 Gauge Speaker Cables REAN speakOn to 1/4 in TS from AMS with 0% Interest Payment Plans and Free Shipping. 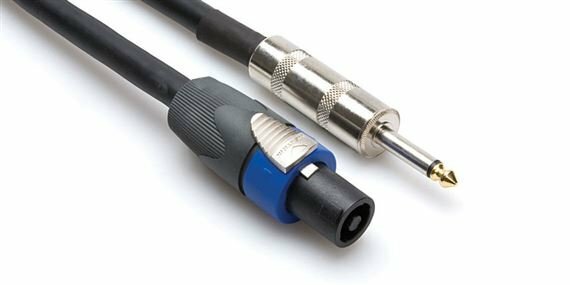 Hosa SKT400Q Speakon to 1/4 Inch speaker cables are designed to provide years of dependable service. High-quality components and world-class manufacturing combine to deliver products of exceptional value. I've been using hosa cables for over 15 years and never had a issue with them. These speaker cables are worth the money. Speakon and Hosa is the best it gets. I love Hosa and Speakon is a better connection choice at times. Great cables for the job and price DJ Brown Eyed Freak!!!!!!! Good materials and good solid construction. MAJOR upgrade for your tone. used to run a homemade weak cable with 1/4 to speak on and tone okay. However upon hooking this up to my Thunderverb 200 with obc115 it was as if someone un pluged my ears! Now that's whats been missing! Don't go cheap on speaker cables its the most over looked part of the signal chain! Heavy gauge, well made speaker cable, works great.